Do you have an event, announcement, or statement you want to broadcast to a group of people? 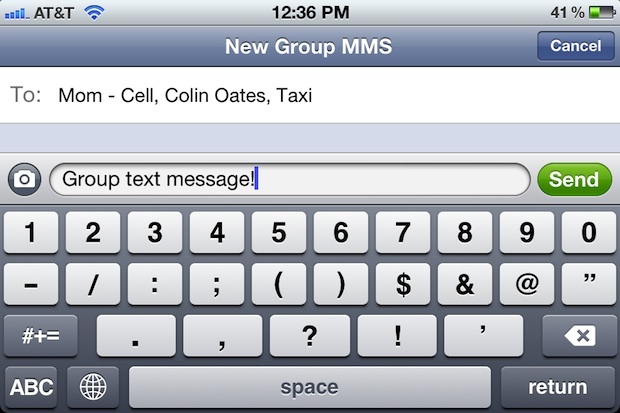 You can easily send out a mass text message to multiple recipients from the iPhone Messages app. The group text will work regardless of whether the contacts you are sending to have iMessage or SMS text messaging, though iMessage users will have a few more features than those who don’t. Sending a mass iMessage is free to other iMessage recipients. Mass texting with SMS may not be, but some cell carrier fees wrap a single group text to count as one message rather than individual SMS’s. Of course, receiving replies will count against your standard texting plan as usual though, if the message is not transmitted through Apple iMessage protocol. Basically if you’re group chatting with other iPhone users, its almost certain to use the blue-bubble iMessage, whereas if you’re group chatting with Android and Windows Phone users, you’ll probably see the green text chat bubble instead, indicating SMS. This feature works with all versions of iOS though it looks a bit different depending on the version installed on your iPhone, iPad, or iPod touch. Do note that older versions of iOS had to have group texting manually enabled, but it is now activated by default in modern versions. Additionally, iMessage users with modern devices gain many neat group chat features, which is basically a subset of the ‘bulk text’, as it actually creates a group conversation thread when these are sent – almost like a chat room. Is there a limit on the number of people you can send? Can you send to a group from your Contact Groups? The limit is only in your patience for manually adding every entry, hopefully Apple improves that. You guys are charged for receiving texts? We’re charged for everything in the USA, such is life in a corporatocracy. Imagine you have over 20 people you need to include in your message… can’t apple just make life easier by letting you “check” the person you need to include in your group message? I know 3rd party app can! The max number you can send to is 20……cheers…. U can not text more than 10 people using this method! Thanks for the tip, I found this searching in google, but what I want to do is set up an iCloud Group and be able to select it and send a text message to that group without having to select each contact individually. is it possible? i`m tryng to do the same thing send like bulk sms to at least 500 peoples at once any solutions? europe..
To my utter surprise iphone dont have the option of selecting all the recipients in one go.You keep on jumping back and forward to add contacts which is time consuming. I spend so much money on this crap. Agreed. This is a giant pain. The combination of a max of 10 recipients and having to jump back and forth to the contacts folder to select each recipient individually is a pain. Why you can’t just go to contacts, select everyone you want into messaging beats me. then you will see the group, then add it. 7- It will take some times to send but it will send it to your 500 contacts for sure. That only works if the contacts only have mobile numbers in their details, if you also have a email address for the contact then this approach will not work. My congratulations to the programming hero who is responsible for starting every time from the beggining of the contact list when entering a new recipient. Please let me kniw how to solve this problem or I will have to charge my old Samsung to send Christmass greetings. I would like to select multiple recipients from the contact list in one act and would not like them to interract except with me. So far I havent find the way to do so. Please let me know how to do that or if it is not possible see how it is done in android and correct the next version of ios.